Summary : This tea wasn't what I was expecting, as it has a surprisingly strong flavor of coconut to it. I found the chocolate and marshmallow flavors to be weak. Still, if you, or your kids, like coconut, this tea is most definitely for you. Review : It's been a while since I've had a "strange and exotic" tea. And by strange and exotic, I mean something you dont' find in any old online tea store. And so, with that in mind, I headed straight for the stash of teas I have from Little Snowbird Teas. They have created some of the most unique and exotic teas around, mainly because their teas are meant for kids and adults who like sweet things...such as me. And the first tea I grabbed was a interesting rooibos tea called Candy Bar Cream. The Candy Bar Cream Rooibos Tea from Little Snowbird Teas contains the following ingredients : Fair Trade Certified organic rooibos, natural and artificial flavors: chocolate, coconut, marshmallow. Here is how Little Snowbird Teas describes this tea on their website : "Serve this when your kids are begging for a candy bar!" Now, I was a bit misled by the name of this tea. I was rather expecting a creamy, perhaps a caramel type flavored tea...as that is what I usually expect when I think of candy bars. But that's just me. The aroma of this tea was different, as they all are from Little Snowbird Teas. It took me a while to place the fragrance, but eventually I figured out what I was smelling was coconut. Admittedly, that disappointed me a bit, as I'm not the worlds biggest fan of coconuts. Still, I like to keep an open mind on things, so I poured boiling water over the leaves and began to brew the tea. The flavor of the tea pretty much matched what I was expecting. The flavor of coconut in this tea is quite strong. Yet, there was also a creamy flavor to the tea too...just not as strong as the coconut. I guess the best way to describe the flavor of this tea is as a creamy coconut flavor, if that makes sense. Overall, if you enjoy coconut, then this tea has your name on it. But if coconut's aren't your thing...or your kids for that matter...you probably will not like this tea too much. Recommendation : Maybe. It all depends on whether you or your kids like coconut flavored things. 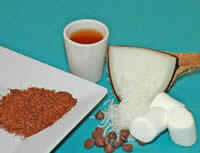 If you and coconuts are meants to get along, you'll enjoy this tea. If not, but you still want something "unique and exotic and sweet," consider giving the Bubblegum Blast Rooibos Tea a try instead.